President Vladimir Putin has expressed Russia’s full support in negotiating a two-state solution to resolve the Israeli-Palestinian conflict after meeting his Palestinian counterpart Mahmoud Abbas in Sochi. 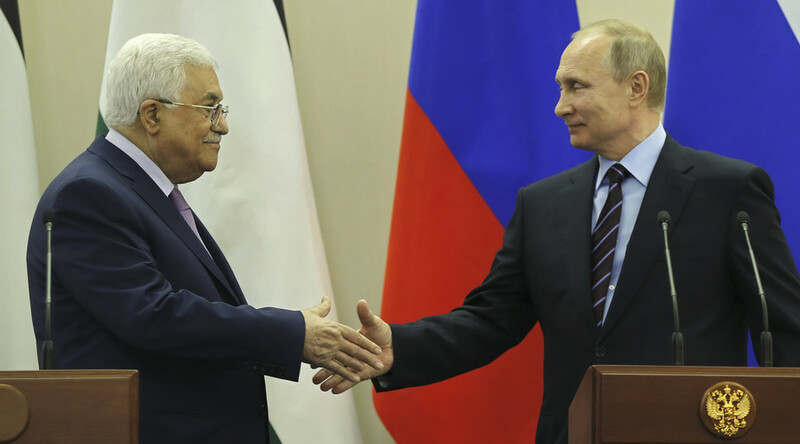 “I would like to stress that peaceful coexistence of two countries, Palestine and Israel, is an essential condition for ensuring genuine security and stability in this region,” Putin said after the meeting with Abbas. 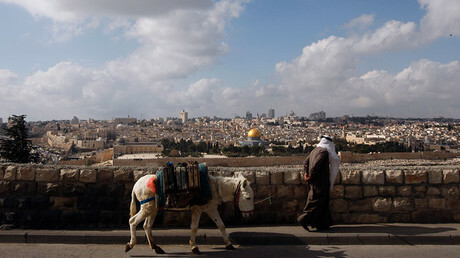 The two-state solution envisages an independent State of Palestine alongside the State of Israel. As the boundary between the two states has yet to be determined, the Palestinians insist on drawing the demarcation lines along the 1967 borders, a precondition rejected by Israel. “Russia is distinguished by its firm stance, a position advocating the creation of an independent Palestinian state within the 1967 borders, with its capital in East Jerusalem,” Abbas said, although the Russian President avoided referencing any borders in his remarks. The Palestinian-Israeli peace talks have stalled since the efforts of the US failed three years ago. The two sides broke contacts after Palestinian President Mahmoud Abbas forged an unexpected pact with Hamas on the governance of the Gaza Strip. Israel sees Hamas as a terrorist organization which aims for the ultimate destruction of the Israeli state. The illegal construction of Israeli settlements on Palestinian lands is also a major obstacle to progress. Abbas has demanded that Israel halts construction on lands claimed by Palestine and release Palestinian prisoners. Netanyahu has refused to entertain any such requests but said he is ready to meet the Palestinians anytime, anywhere, without any preconditions and mediators. Since then, both Russia and France have offered to host delegations from Israel and Palestine for peace talks. Moscow has proposed that Palestinians and the Israelis meet under the Middle East peace quartet supervision – Russia, the US, the UN, and the EU. For his part, Abbas welcomed the Russian initiative calling Russian participation in the negotiations process essential. “It is not possible to resolve the Palestinian issue without Russia’s real participation. This is our aim and we always say this at all international platforms,” the Palestinian leader said. Putin and Abbas also discussed the opening of a new Russian aided multipurpose cultural complex in Bethlehem as well as the reconstruction of the city’s main sites, including Star Street leading to the Church of the Nativity.